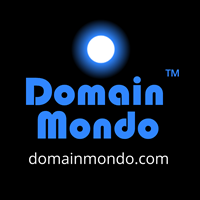 Domain Mondo | domainmondo.com: News Review: ICANN Says It Is Ready for the IANA Transition, Is It Really? News Review: ICANN Says It Is Ready for the IANA Transition, Is It Really? "ICANN reiterates that it, as an organization, and with the support of the global multistakeholder community, is ready for the IANA stewardship transition to occur." --see FEATURE further below. • .The U.S. economy, absent consumer spending, is basically in a recession, said billionaire bond-fund manager Bill Gross, in an interview with Bloomberg Television. While employers are hiring, he said “there’s a dearth of investment spending.” See also The Great Productivity Puzzle | NewYorker.com: "Whatever is driving the slowdown in productivity growth in the U.S. appears to be affecting many other advanced countries, like Japan, Germany, France, and the United Kingdom. What is it?" and The big puzzle in economics today: why is the economy growing so slowly? | Vox.com. • The Big Disconnect: Triple record for U.S. stock indexes | SeekingAlpha.com: "All three major U.S. equity indexes rose to new highs on Thursday, in an alignment that hasn't occurred since December 31, 1999." --A bullish indicator or bearish? Blended earnings decline is 3.5% year over year. If the S&P 500 index reports a decline for Q2 once all results are in, it will be the first time the companies in the index will have reported 5 straight quarters of earnings declines since the financial crisis (Q3 2008 - Q3 2009). The number of companies issuing negative guidance for Q3 is double those guiding higher (53 vs. 26). Wall Street analysts now expect Q3 2016 earnings to decline 1.7% versus the 0.4% growth factored into their models on June 30th. Earnings expectations are now reduced for every sector (not just energy) since the end of the Q2. • FEATURE: ICANN Says It Is Ready for the IANA Transition, Is It Really? ICANN stakeholder #1: "What is ICANN: public governance body or private coordination body? ICANN by its function is a public governance body, if it is a private body by its form and incorporation that is just an anomaly. All the discussions/ activities regarding the transition process etc are basically aimed at addressing this anomaly, in the practical ways possible. ICANN should therefore be subject to same level of transparency requirements as say the government of the US or of India is subject. Quoting 'standard commercial practices' cuts no ice. Government of India will not be able to give this response to a right to information query." ICANN stakeholder #2: "ICANN by its function is not a 'public governance body' - it is actually a coordination body that supports the stable and secure operation of the Internet’s various identifier systems ..."
3. The vast majority of comments submitted to the Proposed Amendment to .COM Registry Agreement (comments closed August 12), indicate the global multistakeholder community wants a "public governance body"--a domain name price regulator, an intellectual property rights regulator, etc. --not a "private coordination body." How much longer will ICANN remain in denial? How long will the global multistakeholder community tolerate ICANN before looking elsewhere for a public governance body that better meets its needs? Brazil Senate Indicts Dilma Rousseff, Opens Impeachment Trial | NBCnews.com: Brazil's Senate voted overwhelmingly on Wednesday [Aug 10] to indict President Dilma Rousseff on charges of breaking budget laws and to begin an impeachment trial that is expected to oust her from office and end 13 years of rule by the Workers Party. 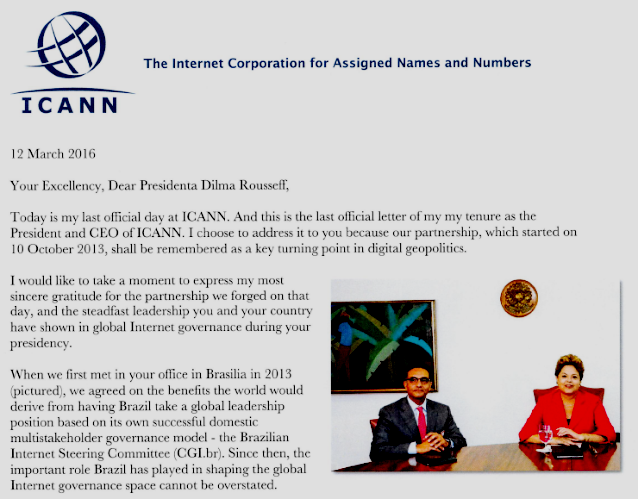 See also Brazil Insulted by ICANN President & CEO Fadi Chehade Farewell Letter. • Cruz, Lee, and Duffy Increase Scrutiny on Obama Administration's Planned Internet Giveaway | Ted Cruz | U.S. Senator for Texas August 12, 2016: "... We therefore respectfully request that you respond to the following questions no later than 5:00 pm on August 15, 2016: (1) Has the DOJ conducted a competition review of Verisign’s .com Registry Agreement with ICANN to assist the NTIA in determining whether the agreement should be extended to 2024? If so, please provide a complete copy and summary of the review. (2) If not, will the DOJ conduct a competition review of the .com Registry Agreement before the agreement is extended and the NTIA transfers its oversight authority to ICANN? Please explain." • New gTLD Registry Operator StartingDot "throws in the towel"--Afilias Acquires StartingDot | BusinessWire.com August 08, 2016: "... acquisition of StartingDot, the Registry Operator for 3 new TLDs: .ARCHI, .BIO and .SKI. The acquisition agreement is part of Afilias’ ongoing program of acquiring new TLDs to add to its portfolio ... Other Registry Operators interesting in talking with Afilias should contact us at WeBuyTLDs@Afilias.INFO." StartingDot Executive V.P., Stéphane Van Gelder, currently chairs ICANN’s Nominating Committee, and recently wrote a critique of ICANN in CircleID. • Approved Board Resolutions - Verisign as Root Zone Maintainer | Special Meeting of the ICANN Board - ICANN: "Whereas, ICANN and Verisign finalized negotiations on the terms of the proposed RZMA for Verisign to perform the root zone maintainer function, and published the proposed RZMA for a 30-day notice period as required by the IANA Stewardship Transition Coordination Group (ICG) proposal ... Resolved (2016.08.09.05), the proposed RZMA is approved, and the President and CEO, or his designee(s), is authorized to take such actions as appropriate to finalize and execute the Agreement." • ICANN Announces Incorporation of Public Technical Identifiers (PTI) | ICANN.org August 11, 2016: "ICANN today announced that the incorporation documents for the "Post-Transition IANA" organization have been filed and received by the California Secretary of State under the name Public Technical Identifiers (which will now be referred to as PTI). With this filing and receipt, PTI is now formed as a nonprofit public benefit corporation and controlled affiliate of ICANN. Walmart Agrees to Acquire Jet.com, One of the Fastest Growing e-Commerce Companies in the U.S. | walmart.com: "... Walmart to acquire Jet for approximately $3 billion in cash, a portion of which will be paid over time. Additionally, $300 million of Walmart shares will be paid over time as part of the transaction ... Walmart and Jet will maintain distinct brands, with Walmart.com focusing on delivering the company’s Everyday Low Price strategy, while Jet will continue to provide a unique and differentiated customer experience with curated assortment." Baidu Is Bringing Intelligent AR to the Masses | technologyreview.com: "... Chinese Internet giant Baidu [baidu.com] has announced a new AR platform that will allow people to make use of the technology from within many of the company’s own apps. The system, called DuSee, is claimed to make use of "sophisticated computer vision and deep learning" to “understand the 3-D environment, and create virtual objects that have rich interactions with the user and the real world.” The platform seems to sit somewhere between basic AR systems, like those used in Pokémon Go, and more advanced technologies, such as Google’s Tango." Google Under Antitrust Scrutiny in South Korea | WSJ.com: "Issue appears to revolve around the pre-loading of Google apps on Android smartphones"
High-Frequency Trading Is Nearing the Ultimate Speed Limit: "A network switch made by the firm Metamako allows a trade order to be placed in the time it takes a photon to travel about 90 feet." The bandwidth bottleneck that is throttling the Internet | Nature.com: "... with global Internet traffic growing by an estimated 22% per year, the demand for bandwidth is fast outstripping providers' best efforts to supply it ..."
Google isn’t safe from Yahoo’s fate | TechCrunch.com: "Google in 2016 = Yahoo in 2000? It’s possible ... Beneath the clean upward trajectory of Google’s success, the digital advertising industry that it has long ruled over has fallen into turmoil and rapid change. It’s not clear if Google’s advertising business will sustain its dominance." See also: Bill Maris, the CEO and founder of Google Ventures, is leaving | Recode.net: "Maris would be the third high-ranking executive to depart from the Alphabet units outside of the main Google search business in recent months, as the tech giant continues to stumble through the transition into its new corporate structure." And this: Google Alphabet report card | BusinessInsider.com: "Alphabet lost $859 million on these 'Other Bets' companies in Q2, versus losses of $660 million at the same time last year." Readers - top 3 countries: 1. U.S.; 2. Germany; 3. France. Oil traders bid farewell to Yahoo Messenger | SeekingAlpha.com: "Yahoo is shutting down its "legacy" Messenger platform, the main tool used by oil traders to communicate since the late 1990s. The follow-up version of the messaging service cannot be used by the industry as it doesn't meet compliance standards like saving conversations." There's More Than One Way to Publish. I Know. I Tried Many of Them | publishersweekly.com: "An author discusses the publishing options she’s tried: traditional, self-, and, for her sixth book, Amazon ... in its first month, despite its limited bookstore availability, I have sold more copies of In Twenty Years than I did of my third and fourth novels combined. In Twenty Years has been well reviewed, but I have not madly tap-danced on social media, and I have not slowly spiraled into crazy worrying about promotion ..."
China is flooding Silicon Valley with cash. Here’s what can go wrong. | WashingtonPost.com: In China, where there’s less rule of law, a powerful government relentlessly pushing for growth, and enormous competition among companies, brass-knuckled business tactics are more common, said Thilo Hanemann, an economist at the Rhodium Group. “... reflections of cultural norms of how business is conducted in China. The Chinese investor may ask for terms that would be considered overly aggressive in Silicon Valley, but these terms would be considered fair in China,” said Connie Chan, a partner with the venture capital firm Andreessen Horowitz. The Dirty Little Secret of Finance: Asymmetric Information | Bloomberg.com: "... financial markets ... [are] driven by differences in how much people know. ... asymmetric information ... It’s key to the way traders, including high-frequency traders, make their profits. And it’s probably at the root of why markets break down and crash." Interview With A High-Frequency Trader | ZeroHedge.com: High-frequency trading (HFT)–thousands of algorithmic-driven market transactions per second–now accounts for over 60% of all trades on American exchanges". How does HFT affect retail investors? "... Supporters claim that high-frequency traders (HFTs) are a net-positive market force because they provide liquidity and tighten bid-ask spreads. They say that high-frequency trading is rarely if ever used for nefarious purposes, and regulators make sure of it. On the other side, detractors claim that HFTs regularly manipulate unaware investors and otherwise destabilize markets. They say that HFTs are a net-negative force on the market and should be reined in ..."
Why even the best investing advice may be wrong | MarketWatch.com: "Just think back to the Brexit vote, when a bunch of economists and market observers said things would get ugly fast in Europe. Instead, the market took a knee-jerk quick slide down — just enough for some of those pundits to claim they were right — before jumping off to new highs." Why China is Supercharging Dissident Trials | WSJ.com: "... In recent years, the government left maneuvering space for activists to pursue causes that do not have direct political implications. They did this, in part, to provide a safety valve for the letting off of social pressure. The trials last week and the accompanying propaganda offensive signal that the government has changed its mind ..."
Clinton & Establishment Media Anti-Trump Narratives: Are all those 'Trump controversies' raising doubts in Trump Nation? Not really | LATimes.com: "... Cervantes doesn’t think Trump will start deporting or monitoring law-abiding Muslims. He’s close friends with a Syrian American family and would never want to see them harmed. “I just think the ones coming in should be screened extremely well,” he said ... the thought of a Clinton presidency overshadows any of Trump’s flaws in his mind ..."
Every Number Tells a Story | FarnamStreetBlog.com: “Yet numbers also revealed abstract patterns,” writes Alex Bellos in his fascinating book The Grapes of Math: How Life Reflects Numbers and Numbers Reflect Life, which, he continues, “made them objects of deep contemplation." Advice for Startups: "Multi-tasking isn't a thing, switching costs are huge, do one thing at a time and do it really well. Find a way to block out interruptions ... Read every essay Paul Graham has written ... Everyone has a hidden stash of domains they've never used ..."--Ben Dixon in What I'd tell myself about startups if I could go back 5 years. See also: Read This Before Naming Your Startup | thenextweb.com.